A visit to Biafra Herald website publication log will convince any reader of this article that countless times Family Writers Press through its publications warned Nigeria government to organize referendum for Biafra without further delay before October 1, 2017 deadline or risk loosing relevance and respect of Biafrans after October 1, 2017 as their legitimate federal government. Handlers of Nigerian government would have written their names on the sand of history should they have organised Biafra referendum when the ovation is high and counted among the heroes of freedom, than now when Nigerian government is leaving and packing out of Biafra Land in shame. For those who may not know, Nigerian government lost her constitutional powers over Biafra Land and became a mere occupational alien government in Biafra Land since October 1, 2017 when the ultimatum to organize referendum for Biafra expired. It is unfortunate that many so-called educated people, political elites and some religious leaders of shame in Biafra Land and beyond are yet to ask themselves "what is the significance of Biafra people rejecting the military useless vaccination of children as was done by the people all over Biafra Land recently"? It was a sign that Nigerian government is no more recognized in Biafra Land. May I tell Nigerian government that the rejection of the military vaccination marks the end of any immunization that will be administered to Biafra children which will be sponsored by Nigerian government because nobody knows what Nigerian government will do with the left over of the obnoxious military vaccines. Anambra State governorship election billed for November 18, 2017 which is just barely 3 weeks is going to be a day to demonstrate a total disrespect to Nigerian government by Biafra people in Anambra State because the people unanimously declared that there is not going to be a single vote casted in November 18 in Anambra. The people of Biafra all over the world have rejected Nigeria and everything in Nigeria and thereby have given Nigerian government till October 1st deadline to organize referendum for Biafra but Nigerian government ignored the call. The people of Biafra will on November 18, 2017 prove to Nigerian government that they have rejected Nigeria and everything in it including its elections. Nobody will compel the people of Anambra to boycott the upcoming election but because they have completely lost interest in the affairs of Nigeria government, there will be 100% election boycott in Anambra State. There is going to be an unprecedented election boycott in Anambra State in such a manner that has never happened anywhere in the world. The leadership of Indigenous People of Biafra (IPOB) worldwide under the Supreme command of Mazi Nnamdi Kanu wish to make the entire universe to know that Nigeria government has lost recognition, relevance and constitutional grip on the territory of Biafra since October 1, 2017. The world is about to know that any remaining structure of Nigeria government in Biafra Land such as the office of governor of the States in Biafra land, LGA Secretariats, Military barracks domiciled in Biafra Land and police stations are all on occupational capacity but not with the approval of the indigenous people of Biafra. The people of Biafra worldwide are calling on American government, British government, European Union, African Union, International community and the world at large to send their delegates and observers to have first hand report of how the people of Biafra boycotted Anambra election 100% because Nigerian media houses are not going to report exactly what will happen to the world but whatever Nigeria government tells them to report. So, let not the world rely on Nigerian media houses on the report of what will happen in Anambra State come November 18 because Nigerian media will never tell the world exactly what happened. Biafra people have vowed to never participate in any election organized by Nigeria occupational government starting with Anambra election and no Biafran is joking about it. As it is at the moment, November 18 election in Anambra is going to be a fight between the people of Biafra who want political freedom from Nigeria slavery since 1914 and Nigeria occupational government which want the unwilling people of Biafra to remain in Nigeria by force. 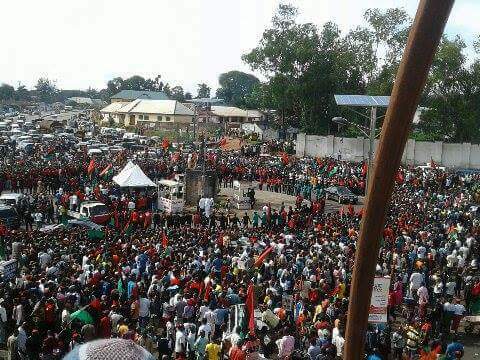 Let it be known to the world that in consolidation of the severance of ties between Nigerian occupational government and the people of Biafra, after November 18 election boycott in Anambra State, IPOB worldwide is going announce the date for Biafra referendum because Nigeria government has failed to do that when called upon to do so. Biafra people have waited for Nigerian government to conduct referendum for too long and after Anambra election boycott, the date for referendum will be announced immediately according to IPOB leadership in one of the previous press release signed by Comrade Emma Powerful. I rest my case!